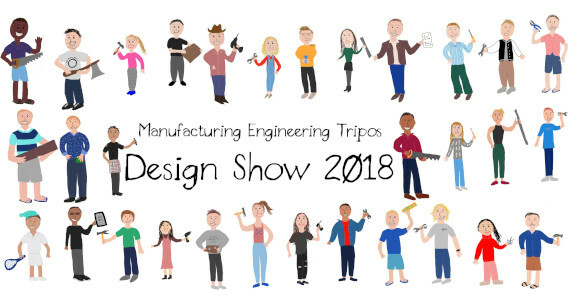 In the first year of the two-year Manufacturing Engineering Tripos (MET) course, teams of three or four students complete a major design project to develop a new product, with real business potential. Dr James Moultrie was awarded a Pilkington Prize in 2017 for his exceptional work on the Design Show. Having first identified a customer need, they research the market, developed original design concepts and create a full business plan. Projects from past years have generated some exciting new ideas and innovative technology, with a number of prototypes going into commercial production and winning national prizes. Students put together displays to explain the technical ideas and business potential behind their design work. The projects are always diverse and normally include conceptual solutions, technical and experimental designs. 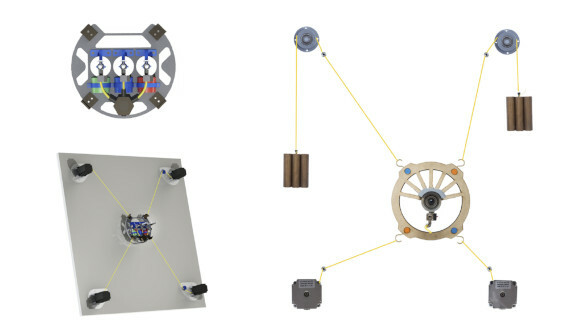 Students are encouraged to produce and show working prototypes wherever possible. AutoBatik provides an automation solution for the time and labour intensive Batik printing process, allowing for customised and creative designs at sustainable production rates for Indonesia’s fastest growing textile market. Batik is a traditional textile resist-dyeing process that is widely used in South East Asia, particularly in Indonesia where the practice has been declared part of ‘the intangible heritage of humanity’ by UNESCO. The Indonesian batik market has seen huge growth in recent years, especially in exports. In spite of this, it is in crisis, with its highly labour and time intensive methods failing to successfully adapt to increasing international demand. 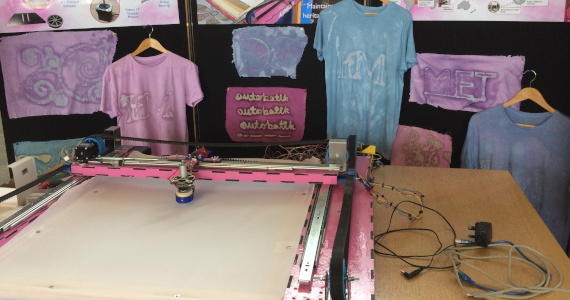 AutoBatik seeks to provide a low-cost automation solution for the batik printing process, allowing firms to increase their production rates while maintaining the use of the complex and beautiful designs that made batik an enduring cultural icon. Building upon the designs of 3D printers and two-axis CNC machines, our product deploys wax based on an input image. Our supporting software allows a huge variety of designs and colour combinations to be employed. By empowering the design process, we look to counter growing youth apathy towards batik, as young people see fewer long-term careers in an industry that is currently dominated by manual processes which require none of the technical or creative skills that are of great importance in other industries. Engaging Indonesian youth is vital for the long-term growth of batik and is a key goal of AutoBatik. Our target customers are SMEs in Indonesia, who we will engage through a subscription or charge per use business model that includes supplies and servicing. Through this strategy we remove the large initial investment that is usually associated with firms automating their production processes, and also allow our users to tailor use of the product to their needs, be it small highly customised batches or mass production. AutoBatik is seizing the future of the batik market, by providing technical innovation that sustains and supports the scaling of a practice from the national to the international. The LeafLogger extrudes solid logs from dry leaves that can then be used in fireplaces or barbecues by the environmentally conscious, making use of natural organic waste. The LeafLogger provides a secondary revenue stream to landscapers collecting large numbers of leaves throughout the year, particularly when the quantity exceeds that needed for mulching or composting. The LeafLogger’s competitive advantage lies in that the machine consumes very little power and makes use of free access to fallen leaves to provide a source of warmth to those aware of their environmental impact. 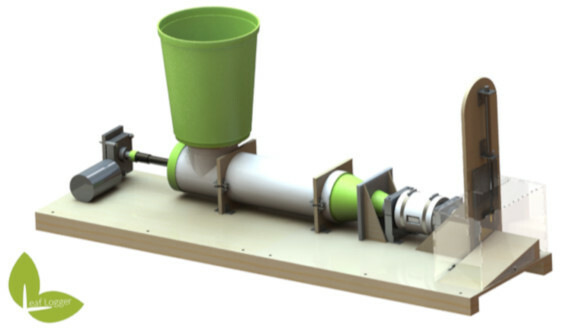 Unlike current methods of producing compact leaf briquettes, the LeafLogger uses continuous extrusion techniques, enabling vast quantities of leaves to be processed in one run. Using a screw extruder, a mixture of mildly shredded leaves and wax are compressed into a log shape and subsequently heated to fuse them together into a solid log. The greatest challenge was designing a low-cost machine where very little was known about the final force and power requirements to produce a log. In addition, making it intuitive to use and fully automated required a great amount of foresight and planning. Naturally, the primary concern was initially in making a high quality product that would be comparable to burning logs, both in terms of heat output and burn ‘experience’. The aim of the LeafLogger is to reduce deforestation by providing a substitute to standard wood logs. The LeafLogs will be perceived by individuals as an environmentally friendlier way of keeping a fire going in one’s home. 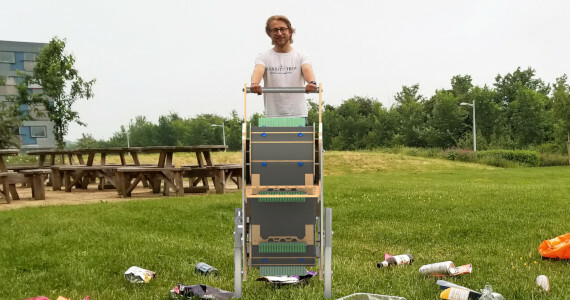 From initially targeting landscapers, local authorities and large country estates, the future potential of this machine could lead to processing other waste materials such as grass, paper or other combustible waste materials and thus further reduce deforestation. The Muracle is an automated mural-painting robot which can paint any image directly onto interior walls using a rope-suspended airbrush, converting blank walls into canvases for artistic expression. Any painting applied directly to a wall is a mural. From prehistoric cave paintings, to masterpieces in ancient temples and cathedrals, to modern-day graffiti and street art pieces, mural painting has stood the test of time. Recent trends have seen a growing pertinence of murals within the interior design industry, particularly in commercial real estate as companies seek to enrich their visual environments. As we enter the age of automation, The Muracle aims to serve this growing sector, allowing a market scale-up beyond the current capacity of mural painters. Removing the human element removes much of the cost and improves the speed of the service, making mural services more accessible. Automating the process may somewhat compromise the creative talent which is principal to the artistic value of murals, but we believe our technology will effectively deliver authentic wall art resembling distinctive styles comparable to hand-painted art; rather than digitally printing wallpapers, which strays from the true definition of a mural. The key design considerations for The Muracle pertain to the painting and movement technology. We use a contactless approach with an airbrush triggered by a valve controlling the flow of compressed air, giving capability for both vector and bitmap images. The airbrush is suspended by ropes under tension which control movement around the wall via two stepper motors. This anchored design allows our product to be scaled to almost any size of flat wall. We envision operation of The Muracle will require minimal human intervention other than set-up and removal of the robot. Our working prototype operates with a single airbrush requiring manual intervention for colour and other changes, but future developments will add multiple airbrushes for multiple colours, and greater automated control of each airbrush. 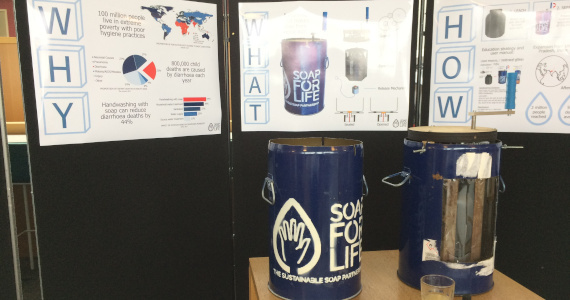 Soap For Life provides cheap and sustainable access to soap for rural communities facing hygiene issues. The non-profit business aims to manufacture and distribute machines which make anti-microbial soap from by-product ash and cooking oil. Soap is essential for preventing disease and illness. Despite being present in most households, it is often prohibitively expensive and prioritised for washing clothes rather than personal hygiene. Our product will address this market failure by providing a decentralised production system, making soap from locally sourced by-products. The machine will be free to the end user and cheap to run. The project will go beyond regular aid and charity projects which donate soap, by empowering communities to produce their own soap in a sustainable and environmentally friendly way. The first stage in the process is to mix ash and water in a vessel and leave it to“leach” overnight, producing potassium hydroxide solution. The potassium hydroxide solution must then be separated from the ash, before finally being heated with oil to produce soap. The machine we have developed is primarily a hand cranked centrifuge, providing a quick and simple way to separate potassium hydroxide from ash. It also acts as a leaching vessel and heating vessel, giving a compact solution for the entire soap making process. We have developed a a user manual to accompany the machine, providing instructions for various combinations of ash and oil, depending on local availability. The manual also educates users on good hygiene and sanitation practices. The project will be funded by charities and commercial soap manufacturers, as our product will open up new markets as well as delivering a public benefit . We will begin by targeting villages which use wood as their main fuel source in Uttar Pradesh, India, but aim to expand globally within five years. While the ratio of ingredients must be reconsidered for each region, the product has value to consumers across the world. The Hexamill is a six-axis desktop milling machine that combines the versatility of a 3D printer with the manufacturing quality of a CNC mill. 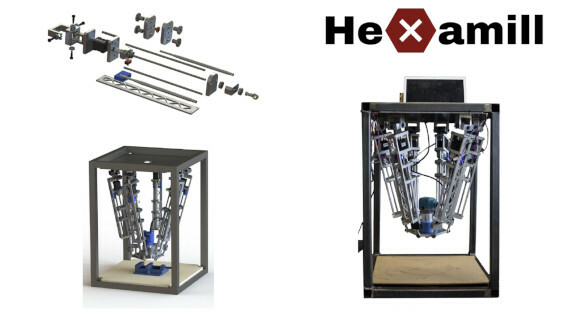 Hexamill brings industrial prototyping in-house. The Hexamill is a low cost, desktop CNC milling machine, designed to allow SMEs to bring CNC milled prototyping in-house. It removes material using a router from a piece of stock material to create the desired shape. Using a Stewart-platform configuration of stepper motor driven lead screw actuators to move the router, the Hexamill can create complex shapes in a range of materials, from foams, to plastics, to aluminium. 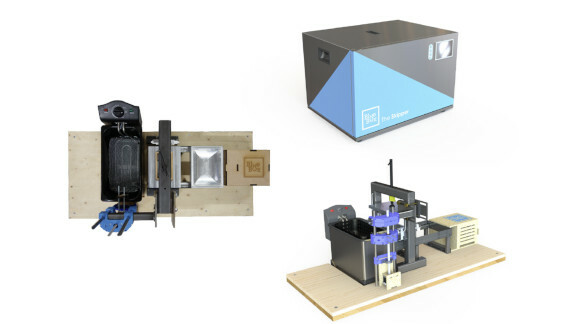 The Stewart-platform configuration allows the router to tilt, allowing up to six axis machining, meaning more complex shapes can be created than by a standard three axis gantry CNC milling machine. Prototyping can be a daily struggle for product design consultancies.There is pressure to create high quality prototypes in a short time scale to demonstrate products to clients. Currently firms most commonly use either 3D printers, or outsource prototyping which requires CNC milling. Both of these methods display problems for the companies; 3D printed parts have poor mechanical properties and outsourcing prototyping is costly and has a long lead time. Neither solution is ideal. This leaves a gap in the market where the Hexamill can provide the solution. The Hexamill provides the ability to produce high quality CNC milled parts for a low cost and on a short time scale, allowing consultancies to meet those tight deadlines while still producing high quality components. With the CNC market set to reach $100.9 billion (US) by 2025, now is an ideal time for Hexamill to enter the market. Ease of use is paramount with the Hexamill system. The Hexamill is designed to integrate with existing industry standard CAM packages, allowing users to run complex G-code with little dedicated training. This will make it an accessible machine for companies to use, providing a prototyping solution for many. The Garbage Guardian collects litter from rough terrain, increasing the rate of collection and reducing the time and cost of labour compared to conventional manual litter pickers. After a music festival, the fields previously populated by joyous music lovers are left with nothing but a coating of empty bottles, food packaging and other discarded rubbish. Clean up operations can span weeks and require hundreds of volunteers to walk thousands of kilometres collecting the waste by hand. In 2017, Glastonbury spent in excess of £785,000 on its 6 week long clean-up operation involving more than 1,300 cleaning volunteers retrieving the waste left by over 200,000 festival attendees strewn across its 900 acre site. The Garbage Guardian uses a rotating belt of tines to collect waste; litter is swept up from the floor before being carried up along an integrated conveyor belt and deposited into a securely fastened, standard bin bag. By simply manoeuvring over rubbish for collection avoids the strain and exertion of energy involved in manual litter picking. The Garbage Guardian allows for continuous collection of discarded litter significantly increasing the rate of waste uptake making for a more efficient, economical and ergonomic process. This product is not just limited to the deserted fields of festivals. Post event clean-ups are often contracted out to companies offering a complete service of collection, removal and disposal of waste. These waste companies prefer to lease their machinery from equipment vendors who then purchase the equipment from manufacturers like ourselves. Selling directly to these vendors supports our initial growth as we can benefit from the vendors’ established reputation and partnerships with waste contractors that already serve high profile events. An autonomous buggy designed to capture hyperlapse footage over a well-defined path, stabilised using a gimbal. It has a simple user interface integrated into a smartphone application. A hyperlapse is a time-lapse taken from a moving perspective, and is an incredibly effective videographic technique. The current method for creating a hyperlapse involves accurately repositioning a tripod numerous times over a long timescale, and the footage generated is often of poor quality and unstable due to human error. Our aim is to create an autonomous vehicle capable of capturing this style of footage with no inputs needed during the shot. Whilst camera sliders can achieve some of this functionality, there are several critical limitations to them, and there are no existing products that perform the range and scope of tasks that our solution is capable of. There are various challenges involved in creating this product. The mount for the camera requires both stability and control in order to vary the orientation during the shot and ensure accuracy. The whole frame must be rigid to maintain this high degree of accuracy, yet capable of traversing a variety of surfaces smoothly. The vehicle must also follow the path defined by the user accurately, usually at a very low speed, and have a simple user interface. Our prototype solves these challenges with a clean, strong design, incorporating a three-axis gimbal into the camera mount. 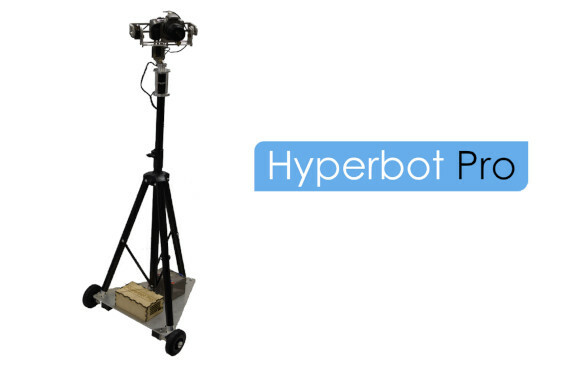 The gimbal is controlled by an Arduino board which is also used to drive the stepper motors and monitor the procession of the vehicle carefully. The systems on the buggy are fully integrated and receive inputs from a smartphone app that is designed with a minimum number and complexity of inputs to ensure simplicity of use. The product is predominantly targeted towards amateur film-makers and hobbyists, enabling them to create semi-professional footage with affordable equipment, although it has the potential to be further developed and refined to breach into the professional market. Paper Mill Thrill is a STEM outreach project for Key Stage 2 and 3 students. The tabletop paper mill will be the centrepiece of an interactive workshop designed to enrich the teaching of engineering processes, science and sustainability. The UK is facing a national skills shortage in STEM. However, there is still a disconnect between industry and the UK school system. Paper Mill Thrill aims to enhance the learning process in the early stages of the UK science curriculum by providing tailored workshops to children in years 3-8. Unlike most STEM workshops, Paper Mill Thrill will demonstrate engineering processes usually only seen in a full scale production line. The tabletop paper mill allows the students to follow the transformation of the paper slurry into quality recycled paper as a continuous process. The mill is a self-contained, portable unit which means the workshops do not rely on schools having the necessary equipment. Given that the ultimate aim of the project is to reach as many children as possible, Paper Mill Thrill would be set-up as a not-for-profit organisation. Schools are already limited in their funding, so licensing the technology and teaching plans to established workshop providers and STEM charities would secure the income needed to remain operational and ensure the widest possible influence of the project. The BlueBox Skipper is an integrated tabletop unit which transforms expanded polystyrene (EPS) into a dense, reusable product. Tackling two unique forms of waste simultaneously, BlueBox’s long term remit is to minimise generation and accumulation of plastic waste in coastal communities. With landfill tax increasing at 3% annually and the environmental devastation caused by single-use goods indisputable, the immense volume of plastic sent to landfill is an ever more pressing concern for individuals and organisations alike. As a result of its low density, recycling EPS through commercial channels is economically unfeasible. The material is instead sent to landfill where it takes up to a million years to decompose, or dumped into the sea where it poses a serious threat to marine life. BlueBox targets a unique type of customer, in the form of local fish markets in coastal communities around the UK. Fish markets are some of the largest contributors to EPS waste, using 22 million single-use EPS boxes each year to transport and store their produce. While current densification systems are clunky, unsightly and energy-intensive, rendering them unsuitable for this demographic, the Skipper is a streamlined, low-volume solution which can be displayed with pride. In exchange for a competitive rental fee, the Skipper enables customers to recycle their EPS on-site as and when they choose. It harnesses a novel dissolution reaction, breaking the material down using waste cooking oil in a unique 4-stage process. First, EPS is shredded and dissolved in a vat of heated oil. The malleable plastic product is then removed and pressed into shape, before being cured using a localised heat source to improve mechanical properties. The output, a re-usable plastic tray, is suitable for immediate resale either to local eateries or directly to customers. What sets BlueBox apart is their unique, community-facing business model. Operating as a Community Interest Company, they donate all surplus revenues to local charitable organisations concerned with the clean-up of plastic debris along the coastline. BlueBox thus tells a unique story, bringing together local businesses, their valued customers and the community as a whole. ReadySteadyGyro is a wearable device to counteract hand tremors. It is a multi-purpose solution, utilising gyroscopic effects to improve stability and control for the user in a variety of applications. Tremors affect all parts of the body and can be extremely debilitating for an individual. Parkinson’s is a common cause of these tremors, particularly among people above 60 - it affects around 1 in 500 people in the UK. Essential tremor is more common still, affecting around 20 times more people than Parkinson’s. The hand is the most commonly affected body part for tremors and is arguably the most difficult to cope with on a daily basis. Hand tremors impact an individual’s ability to do a number of activities such as writing, eating, dressing, cooking, using computers, among many other examples. ReadySteadyGyro is seeking to improve the lives of people suffering from the debilitating effects of uncontrollable hand tremors. 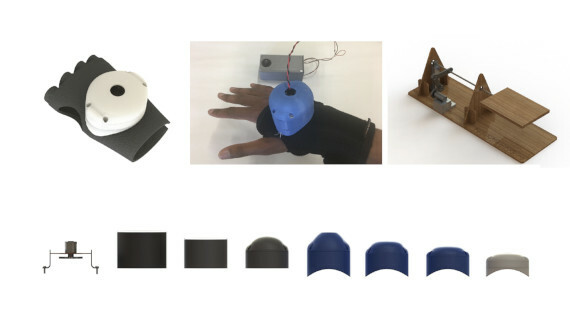 This wearable device, designed to dampen such tremors, will allow users to regain control of their movements and hence reduce their reliance on other forms of assistance. The device, worn like a glove, utilises gyroscopic forces produced by a motor-driven flywheel to reduce unintended movement of the hand experienced with a tremor. 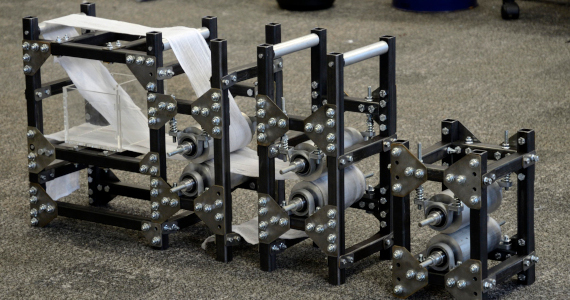 Development involved the use of a test rig to simulate the motion of a tremor and observe the damping effects of prototype devices - varying flywheel shapes and sizes as well as speed. ReadySteadyGyro has received positive feedback, and the desire for a final design which is as unobtrusive and discrete as possible was identified.